Hunter Valley mine electrician Nathan Tinkler borrowed big in 2005, made a fortune from several speculative coal plays, and by 2011 was a self-made billionaire. He had gambled and won, but his volatility and reluctance to pay his debts were making him enemies. He lived the high life as only a young man would, buying luxury homes, private jets, sports cars and football teams, and splurging massively to build a horseracing empire. But Tinkler’s dreams had extended beyond even his resources, and his business model worked only in a rising market. When coal prices slumped in 2012, Tinkler had no cash flow to service his massive borrowings and no allies to help him recover. Within months he was trying desperately to stave off his creditors, large and small, and fighting to save his businesses and his fortune. 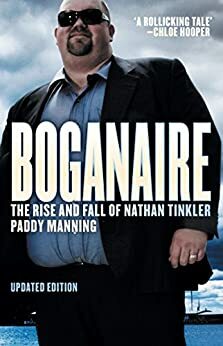 In this impressive biography, leading business writer Paddy Manning tells the story of Tinkler’s meteoric rise to wealth, and captures the drama of his equally rapid downfall. Paddy Manning is one of Australia’s most respected journalists, with fifteen years’ experience including a decade on the business desks of the Sydney Morning Herald, the Australian Financial Review and the Australian – a period in which he was highly commended in the business category of the Walkley Awards and was a three-time category winner in the prestigious Citigroup Journalism Awards for Excellence. His first book, What the Frack: everything you need to know about coal seam gas, was published in 2012. In this impressive biography, freshly updated, leading business writer Paddy Manning tells the story of Tinkler's meteoric rise to wealth, and captures the drama of his equally rapid downfall.